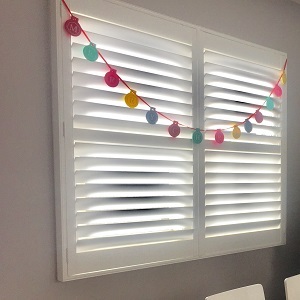 How to Install PVC Shutters - DIY Made Easy! Their job is to secure the frame pieces together for a 3 or 4 sided frame. 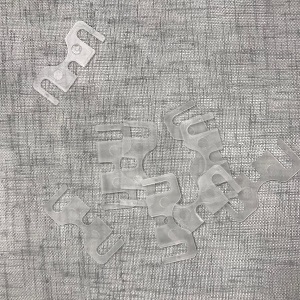 Panel Hinge Packers may or may not be required to assist in bringing out the hinges on your panels a little bit. Simply loosen the hinge screws and insert behind the hinge. 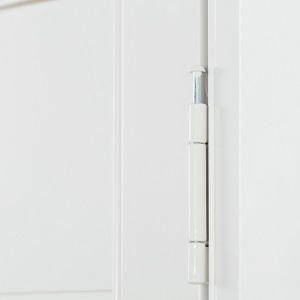 Panel Hinge Pins are how you attach the plantation Shutter panels to the frame. Simply line up your panels with the corresponding hinges fitted on the frame and drop the pin in. Your panels are now attached to the frame! These striker plates are attached to the bottom of the frame in line with where the panel meets the frame in the closed position. Make sure they are aligned with the magnet on the panel for a secure closed position. A 3 sided frame has no bottom. 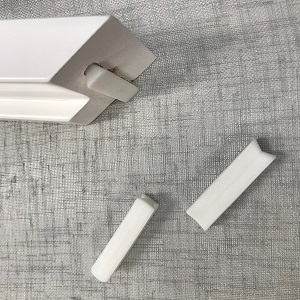 These striker plates are attached to the base of the window frame in line with where the panel meets the window frame in the closed position. These brackets are positioned on either side of your T-posts to hold them securely in place. Simply screw them into the base of the window frame with a 3 sided frame or to the base of the frame with a 4 sided frame. 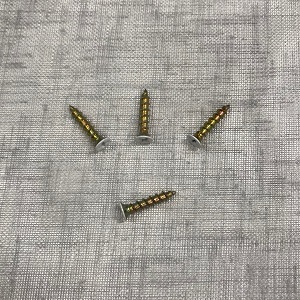 Please note - These screws are not to be used for installing your frames. 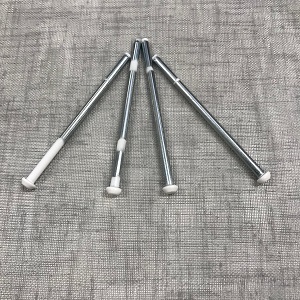 Ensure you purchase the appropriate installation screws depending on the window frame material you will be installing your shutters into - Timber, Masonry or Aluminium. 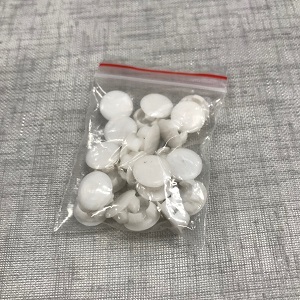 Michael prefers to buy the white stickers from Bunnings to use instead. The process for assembling your frame is the same for an Inside Mount L & Z Frame as well as an Outside Mount L Frame. Each part of the frame will be marked T (Top), B (Bottom), L (Left) or R (Right). Working on a flat surface, lay the frame out in the correct position. Once you have identified the top of the frame, get some masking tape and stick it to the top of the frame - this will ensure a correct installation. The Hoffman keys will already be installed or you will need to insert them into the ends of each frame piece. Working on a flat surface, use the Hoffman keys to attach the corners. If you have a T-post, it will sit inside the frame. Look for the holes marked at the top and the bottom of the frame. Work with your Plantation Shutter Panel Layout Charts to ensure your hinges are facing the correct way and make sure the T-post is not inserted upside down. Using screws, secure the T-Post to the frame. It's a good idea to have someone to assist you - one to hold the panel and one to then insert the screws. You have already assembled your frame. Place the frame inside your recess and jiggle it about to see what sort of gaps you have. Then using your packers, insert them in around the frame. Make sure you use your spirit level to ensure everything is and remains square. Once your frame is packed and square, get some more packers and place them around each of the corners for extra security. This is to ensure the corners stay tight and the mitres won't open when you commence screwing the frame into the window recess. When packing a Z frame you will need to insert your packers in behind the lip of the Z frame. The lip will hide the packers from view. Where the packers are positioned, use your 5mm drill bit to pre-drill the holes through the L frame only - ie don't drill through into the window recess. You don't need to use a lot of them - just space them evenly through each of the frame sides, top and bottom. 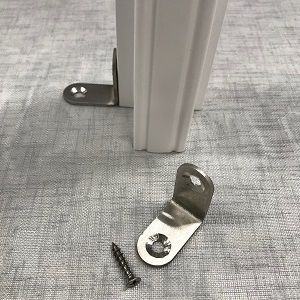 Then get your screws and using your drill, screw them into the L Frame and through so that they just 'bite' into the sides of the window recess. Repeat this process around the frame until the frame is secure. When we present the panels we can see the shutter panel has one half of the hinge and the frame has the other. 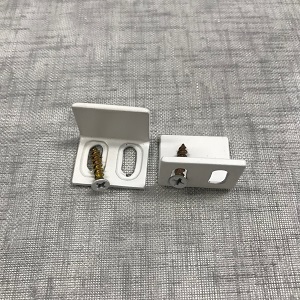 Using the hinge pins included, simply present the panel to the frame, line up the hinges and drop the pin down so it connects the panel to the frame. The hinge on the frame is only attached by the 2 oval shaped holes. This means you have the flexibility to move your panel up or down as required to achieve the right fit. If you loosen the screws, this will allow for approx 3mm - 4 mm of movement. Once you have adjusted your panel height, make sure you then re-tighten the screws through the oval holes. Then lock your hinge into position by inserting a 3rd screw into the round hole in the middle of the hinge. An important step to ensure your panels won't drop. Make sure they are aligned with the magnet on the panel for a secure closed position. Use the screws provided. Your Plantation Shutter is installed! 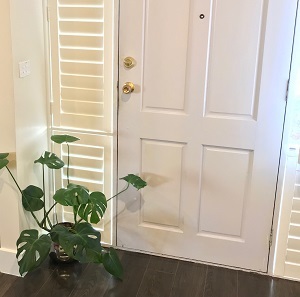 Now everything should open and close nicely. If not make any minor adjustments as necessary. 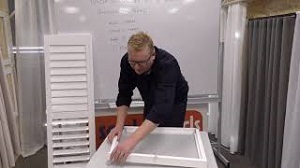 As shutter frames are not a tolerance fit, it is inevitable that you will end up with some gaps between the window frame and the frame of the plantation shutter. These gaps can easily and quickly be filled using 'No More Gaps'. This process will eliminate light from coming in between the 2 frames and your shutters will 'pop'. No More Gaps is the finishing touch required to give you a professional end result. Stay level - Use your Spirit level. If you start level and true then the shutters are going to be installed perfectly, panels will open and close. Watch the video on how to install Inside Mount L Frame first for more details. If you have more than one panel in your layout, you will receive a panel with a D-Mould. The D-Mould stip covers the gap between the first and second panel when they are in the closed position. The D-mould will always be on the Right-Hand panel. Shutters 'dress up' - Make sure you attach your plantation shutter panels the right way up. Once you have assembled the frame, pre-drill your holes evenly around the L frame. PVC Outside Mount L Frame - screws are inserted underneath the cover strip. You will need to remove this strip when installing. This means you can adjust the frame to ensure you mount it level. Now present and attach the panels. It's a good idea to have someone help you here. Holding the bottom of the frame, shuffle from left to right until everything squares up. Once the Plantation Shutter is in the perfect position, open the panel doors and finish attaching the frame all the way around onto the architraves. One of the easiest Plantation Shutter installations. 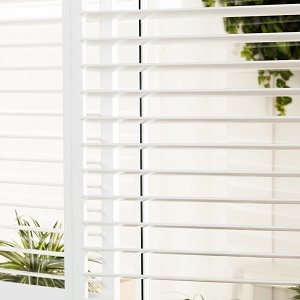 A direct mount plantation shutter doesn't have a frame and it consists of just 1 or 2 panels only. 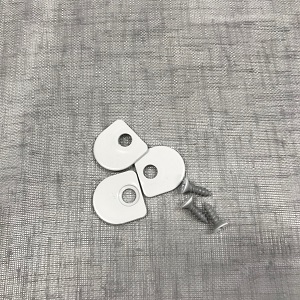 With your Plantation Shutter, you will receive several screws with a white head on them and a couple of striker plates. The hinges are already attached to the panel. Open and present your hinge to the recess. You will see that there are 2 oval shaped holes and a round hole on the hinge. Get someone to hold the panel in position. Screw the oval shaped top and bottom holes of the hinges into the recess first. Adjust the panel to the correct position and ensure it's level. Test the position by opening and closing the panel to see how it looks. Make any adjustments required by moving the panel up and down within the oval-shaped holes on the hinge. Then place a screw in the centre round hole to lock the panel into position. Locate the magnet on the back of the shutter. Install the striker plate into the recess at that exact position. Secure with a couple of screws. Your plantation Shutter is installed. 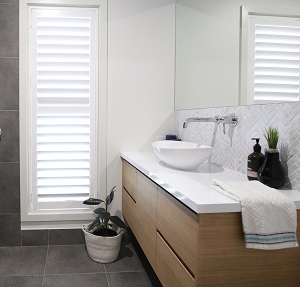 Shutters 'dress up' - Make sure you install your plantation shutter panels the right way up. You will have 2 U channels. 1 big and 1 small. The big U channel goes at the top. The small U channel goes at the bottom. Make sure the U channel is centred in the middle of the recess. Screw the small U channel down or again you can use double-sided tape. Take your panel and lift it into the lip of the big U channel at the top of the recess. And simply drop the panel down into position. 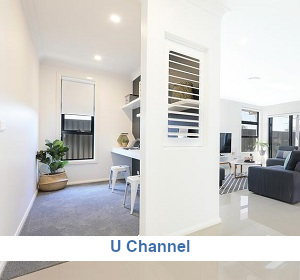 Your U channel installation is complete! Check that your shutter frame is square and level and that you have used the appropriate packers during the installation. A frame that is out of square will result in panels that are out of square. Adjust the squareness and level of your shutter frame to fix this issue. Sometimes you need to slightly move the striker plate to make it sit evenly across the magnet. During the squaring process, the magnets may have become slightly out of alignment and this adjustment will assist. If this fails then you could fit an additional magnet - 4 kg hold strength (available at Bunnings) to hold the panel closed. 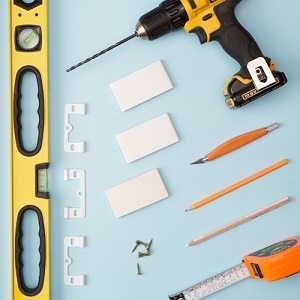 Purchase a Plantation Shutter repair kit from our Spare Parts section. Each Repair kit contains 1 x Spring loaded pin, 1 x Standard pin & 1 x screw for the tilt rod. Use these kits to reattach the blade back onto the panel.